ATHENS, Greece Greece's marathon campaign to reclaim the 2,500-year-old Parthenon sculptures from Britain will be boosted by a long-delayed Athens museum set to open next year, the premier said Monday. Greece hopes the landmark structure, purpose-built to showcase finds from the ancient Acropolis, will eventually host the collection — even as a permanent loan — despite repeated refusals from the British government and British Museum officials. Once the museum is completed, Greece will have a very strong argument for the return of the Parthenon Sculptures, Prime Minister Costas Karamanlis said. We are taking a very important step to finally realize a dream that unites all Greeks. 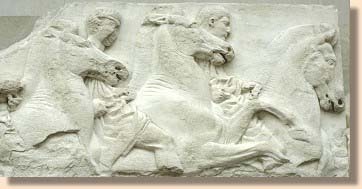 The ancient marble masterpieces originally decorated the upper parts of the Parthenon, built between 447 and 432 B.C. They were removed in the early 19th century — when Greece still belonged to the Turkish Ottoman empire — by British diplomat Lord Elgin. Athens argues the sprawling ?129 million ($162 million) building will allow the sculptures to be reunited for the first time in 200 years, in a direct line of sight with their ancient home. During a visit to the building site at the foot of the Acropolis hill, Karamanlis said the museum will be ready in the first half of 2007. Officials say it will then open to visitors by the end of next year. It will be the most modern archaeological museum in the world, Karamanlis said.